I stumbled across this little gem of a miniseries last week while I was browsing movie recommendations online. Tired of watching the same old repeats and advertisement-rich dross that airs on ‘normal’ TV, I thought I’d try my luck with some independent stuff. There certainly is a lot of crap to sift through on YouTube! However, thankfully, I found The Outs. The Outs is directed by, and stars, Adam Goldman. Wikipedia describes The Outs as “a 2012 miniseries with seven episodes, produced exclusively for Internet distribution.” And that’s essentially what it is. The Outs was entirely crowd-funded, and by the end of two campaigns Goldman had received enough money to make an end-of-series special as well. In 2013 The Outs was nominated in seven categories at the Indie Soap Awards. The story is set in New York City and centres around Mitch, his best friend, Oona, and his ex-boyfriend, Jack. Over the course of six twenty-minute(ish) episodes, plus one special, Goldman chronicles the demise of Mitch and Jack’s relationship in a way that is both funny and touching. 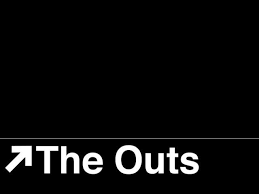 Unlike many of the independent, gay-themed short movies/series that are out there in cyberspace, The Outs, has a great script, a quality cast, and a professionally produced feel. Plus, Jack’s new boyfriend, Paul (played by Tommy Heleringer) is pretty hot. I’d highly recommend The Outs. FYI, on IMDb it rated 8.2/10.